Gerri C. LeBow Halll has some secrets. Here are just a few. You’ve read about the colossal square footage, the green roof and talking elevators. You’ve seen the classroom specs and read the headlines in the press. But before Gerri C. LeBow Hall opened — back when the limestone wasn’t set and Matheson Hall stood at the corner of 3200 Market— some tough decisions had to be made. To get the lowdown, we spoke to Associate Director of Technology Matthew Stocum, who worked with Drexel LeBow Director of Technology Al Riess and Associate Dean Anna Chrulkiewicz as a liaison with architects, construction crews and all vendors responsible for outfitting the building. What follows are just a few of the hundreds of unheralded decisions that helped shape a building. Before ground broke for the summer 2011 demolition of Matheson Hall, plans were being considered to renovate the existing structure rather than knock it down and build from scratch. However, because construction specifications have changed since the 1960’s, it was decided that the floor-to-ceiling heights of each floor of Matheson were too low to compensate for the audiovisual and high-traffic needs of a top-notch, 21st century classroom. That’s right. 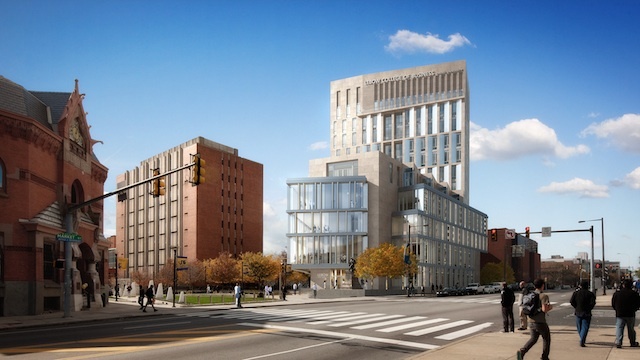 A walkway was supposed to connect the second and third floor of Pearlstein Hall with the new building. It was even in the architect’s original design. Even today you can see the remnants of what would have been those adjoining hallways. However, the architects presented an idea to remove the bridge and the team from Drexel LeBow paid attention. The final decision? The plan was too expensive and would have ultimately eaten up too much floor space in the new building, at the expense of extra space for learning opportunities. “If you look on the second and third floor in the collaboration suites in the northwest corner … that entire hallway is in line with the main hallway in Pearlstein,” Stocum says. “By getting rid of the plan for the connection, we were able to add additional rooms to the collaboration suites in that area. 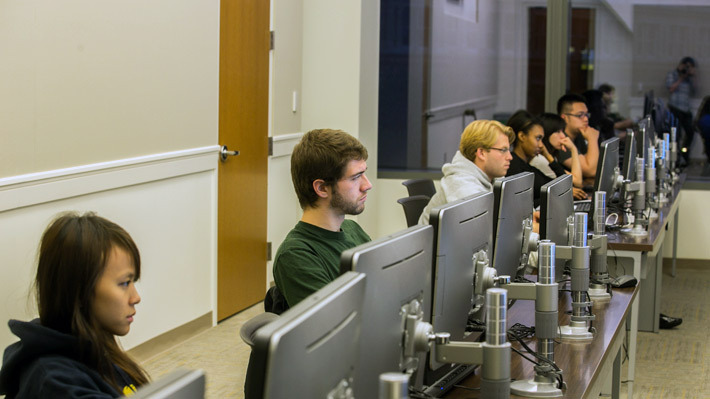 Today, Gerri C. LeBow Hall has 18 collaboration rooms. Without the decision to abandon the hallway, there would only be 12. It’s extremely hard to select furniture for a 177,500-square-foot building. Stocum admits to months of back-and-forth dialogue with furniture vendors regarding gear for the computer labs alone. The main goal, he says, was to find materials that were durable, usable and easy to maintain. Open desk space was a must. Eventually, the team settled on an all-in-one unit attached to a pole, to minimize desk clutter and maximize usable space. But the decision wasn’t made in a LeBow conference room. Rather, Riess, Stocum and a few Drexel representatives hopped in a taxi and traveled east to the furniture vendor’s Center City Office, where they crawled around on their hands and knees and looked at the office’s own unique computer terminal setup. “Pretty much, months of planning were upended in one hour,” Stocum says. What you see today — namely, no power cords — is a direct result of this impromptu fact-finding mission. The result? A cleaner space that is more accessible to the target audience that matters most: LeBow students. The grand staircase: An unexpected Drexel hit. Since Gerri C. LeBow Hall opened earlier this month, Stocum has been especially surprised by the number of students who are using the grand staircase — and how little elevator traffic the building has clocked. Even though elevators are only running at half capacity to accommodate the construction crew currently working on the tower, students have been flocking to the stairs. An exclusive first look inside the Drexel building that will change the Philadelphia skyline. Tour what will soon be a 300-seat auditorium, hi-tech classrooms and office suites with Ryan Williams, a LeBow pre-junior majoring in entrepreneurship.